Both a paid and volunteer positions. Home care aide or nurse - no experience necessary but appreciated. I always need 2 home care aides or nurses onboard so if timing now is not good, stay in touch! When not doing homecare (18 hrs / wk), you would also help as a deckhand, handle lines, take turns in the galley and with nonprofit such as photos, video, event coordination, etc. Paid Home care positions require US Citizen, Green Card, or H1 Work, or C1/D Crew VISA and able to stay with us for a minimum 3 months (6 months or longer preferred) making it a lifestyle, with opportunities to possibly cruise or sail the Carribean and maybe Mediterranean in addition to America's Great Loop. Volunteer positions are on-board expenses paid, open to International persons with B2 Business VISA or B1 Tourist VISA, a minimum of 3 month / 90 Days, preferably longer, with earned bonus of return travel expenses, etc. We have cruised 2000+ miles from Louisville, Kentucky to New Orleans, Louisianna, South along Florida's West Coast to Fort Myers, and are headed to the Florida Keys, and Bahamas next. You should have a lust for adventure and open-minded, easy-going personality, with a desire to help others and improve the world. I have been designing and implementing modifications to the vessel to make it 100% wheelchair friendly (75% complete). I am a quadriplegic man who uses an electric power wheelchair after forced landing plane crash 15 years ago due to engine failure after takeoff. I have been designing and creating solutions to empower mobility impaired individuals through greater independence for the last 15 years including working with Veterans Administration and other orgs throughout the country. You will likely share a cabin, but there may at times be an opportunity to have your own cabin. 4-5 persons will be on board. 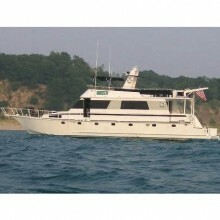 We also have a unique volunteer opportunity coming in mid May 2019 for someone who is mechanically / handiman inclined especially with experience on boats and able to handle lines on a 76' Motor Yacht that will be cruising from Chicago to Canada , New York, and down the East Coast via the Great Lakes. 2 Wheelchair Friendly Vessels: 62' Aluminum Pluckebaum Baymaster and 76' Aluminum Darling Motoryacht. We are a 501(c)(3) nonprofit organization. We will be cruising, circumnavigating the Eastern continental United States and Canada over 6000 miles on America's Great Loop. We are doing something big that gets people's attention to build more awareness around access to home care for disabled and aging focused on Inspiration, Education, Motivation, and building Public Awareness. We will be stopping at Veterans Administration facilities, Hospitals, and rehabilitation centers partnering with local nonprofit organizations around the country. Opportunities for disabled individuals and their spouse or caregivers to come aboard and have a bucket list cruising experience is combined with day trip events organized through local nonprofit partner organizations for wheelchair users and their guests while getting the local media's attention. In major cities therapists and other professionals will be able invited aboard to see the latest in independent living technologies. Cruising America's Great Loop involves stopping at many cities and spending the week, smaller towns for provisioning or 50 of 70 of the United States national parks. We will be heading South from Chicago, IL and Louisville Kentucky on the Ohio River in late 2018. Then to the Tennessee River and the land between the Lakes, south through Alabama on the Tombigbee canal to Mobile Alabama, then west to Texas Gulf Coast and Florida during winter. Would like to visit Bahamas, April up East Coast ICW. Future possible opportunity: We are also working on acquiring a custom, one-of-a-kind, 52 foot aluminum sailboat designed from the keel up to be captained by a wheelchair user with electric sales, etc. Currently in the Mediterranean, and would need to bring it across the Atlantic during the fall of 2019 or 2020 to provide adventure trips from Florida to Cuba to Dominican Republic and back for adventurous handicap wheelchair users. Abuse of anything such as alcohol or drugs will not be tolerated. Boat descriptionPossibilities is a 62' Aluminum Pluckebaum Baymaster, modified for 100% wheelchair friendly access throughout for America's Great Loop. Inclusive Adventures is a 501(c)(3) nonprofit organization. We will be cruising America's Great Loop, circumnavigating the Eastern continental United States and Canada over 6000 miles. This cruise involves stopping at many cities and spending the week, smaller towns for provisioning or 50 of 70 of the United States national parks. We will be heading South from Louisville Kentucky on the Ohio River, then to the Tennessee River and the land between the Lakes, south through Alabama on the Tombigbee canal to Mobile Alabama. Photos and Video of Wheelchair Accessibility Aboard: https://photos.app.goo.gl/QSZAMXsXab1mX5uKA Video of Wheelchair Dinghy: https://photos.app.goo.gl/VyGWXDi6eXozbAyr8 Later west to Texas Gulf Coast for Dec., Florida in Feb., Would like to visit Cuba for a few weeks and Bahamas, April up East Coast ICW through Washington DC and New York to Hudson River & Erie Canal to Great Lakes, Canadian heritage canals, self through Lake Michigan to Chicago and down the Illinois River to the Mississippi. Follow us on F.B.! Future possible opportunity: I am also working on acquiring a 52 foot aluminum sailboat designed from the keel up to be captained by a wheelchair user with electric sales, etc. Currently in the Caribbean, and would need to bring it across the Atlantic sometime in the next year to provide adventure trips from Florida to Cuba to Dominican Republic and back for handicap wheelchair users.